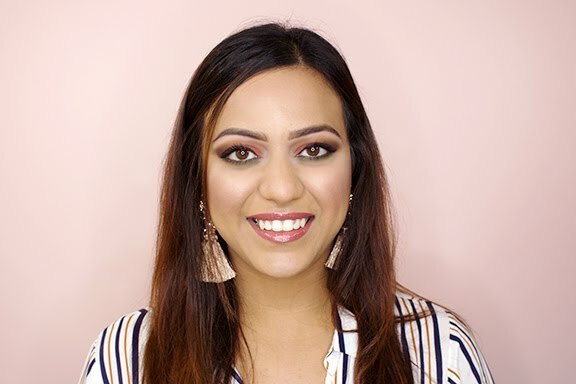 Last week I got together with another Toronto blogger, Saima Style, to collaborate with on this post! We took a basic, black-and-white striped cardigan from H&M and came up with six different looks using it. 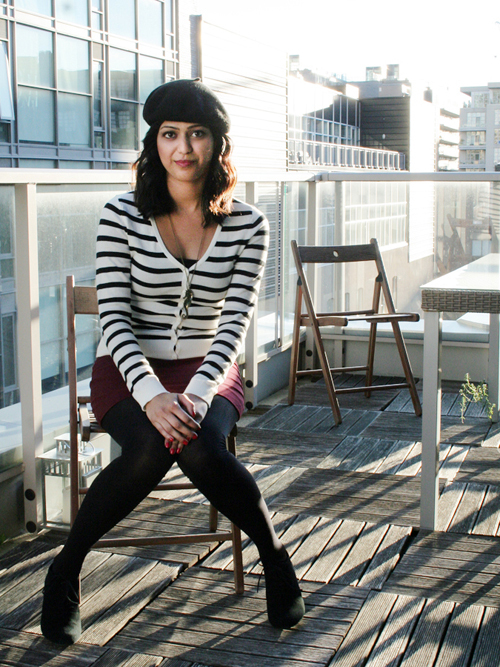 I'm posting three that I wore and styled here on my blog, and Saima has three uploaded on hers, so be sure to check out all six outfits! Keep reading more for outfit details and what inspired me to create the looks! Buttoned-up collared shirts are going to be seen everywhere this fall/winter! I wanted the cardigan to be the main focus in this outfit, so I made sure of that by pairing it with a neutral-coloured top. I also added one of my favourite pearl necklaces to enhance the collar and finished the look with beige pumps. 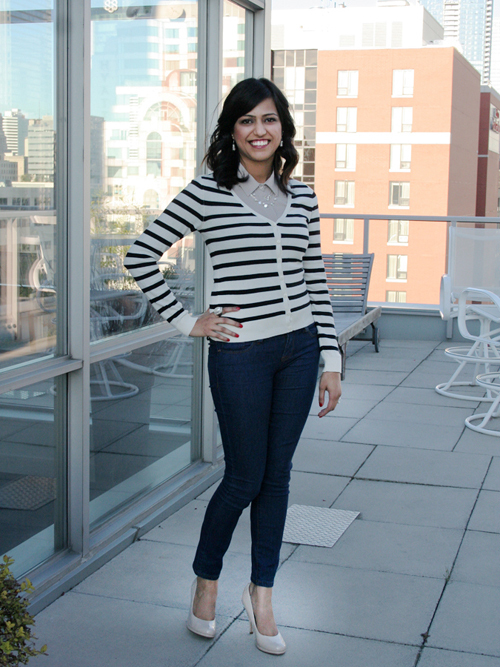 If you work in a semi-formal office and are allowed to wear jeans, this look can definitely be worn to work! Otherwise I suggest wearing this to a fun girls night out. If you've been following my blog for a while, you've probably guessed by now that I'm obsessed with light brown leather. 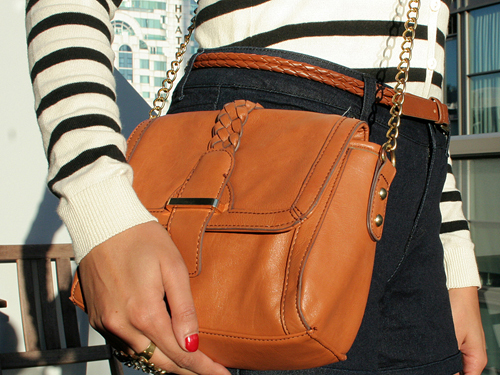 In the outfit above, I highlighted that colour by adding a light brown belt with a matching crossbody handbag. The shorts suggest that this look is super casual, but definitely trendy for fall because of the leggings. I'm in love! You can call this colour burgundy or maroon, either way, it's VERY in right now and I just had to have a piece of it. 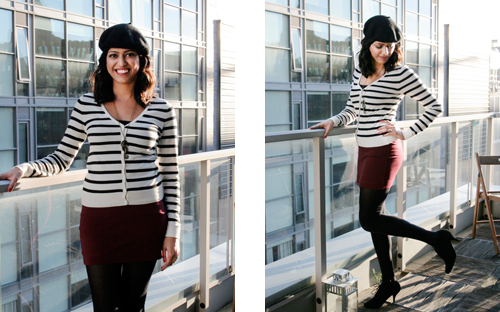 For this outfit I tried on a beret for the first time in my life, and I actually really like it on me. You'll definitely be seeing more of it on this blog! I wore a similar outfit like this to a friend's place the other night, as it was a nice dinner and get-together. I decided not to go too heavy on accessories, because the stripes were already almost overbearing the entire look, so just kept it simple with a gold-and-black necklace; it has a sea horse on it!